Pull the trigger on adding KISS to your action figure collection! 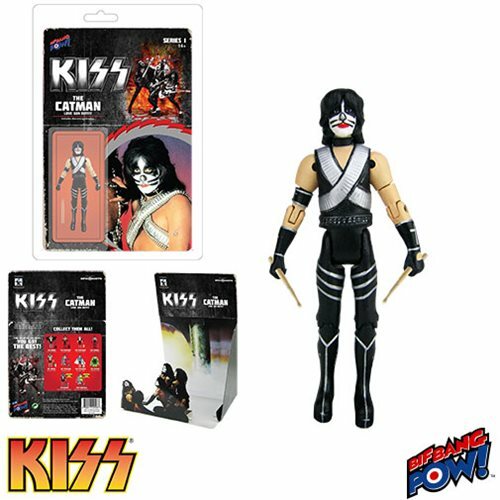 3 3/4-inch scale action figure of The Catman from KISS! Features 11 points of articulation and comes packaged with a fold-out diorama. For over 40 years, KISS has been rockin’ arenas around the world with spectacular concerts that showcase levitating drum kits, pyrotechnics and their uniquely painted faces. Now the outrageous members of this world renowned rock band are available for the first time ever as 3 3/4-inch scale action figures from Bif Bang Pow!. KISS Love Gun The Catman 3 3/4-Inch Action Figure Series 1 features character-specific clothing and accessories distinct to the band member from the Love Gun album. This exceptionally detailed figure features 11 points of articulation, includes a pair of drumsticks, and comes in full-color packaging with a fold out diorama. Put The Demon and Starchild together to form the Alive II stage while Spaceman and Catman form the Love Gun stage (each figure sold separetly). Fans and loyal supporters of the KISS Army will want to rock and roll all night with this collectible figure! Ages 14 and up. Flash Gordon in Red Tank Shirt 3 3/4-Inch Figure - EE Excl. Shark Tank Kevin, Lori, Robert 3 3/4-Inch Figures-Con. Excl. The Big Bang Theory Howard Jester 8-Inch Figure - Con. Excl. The Big Bang Theory Raj Gentleman 8-Inch Figure - Con. Excl.